Ange Loft is an artist and member of Canadian No-Wave band Yamantaka//SonicTitan. 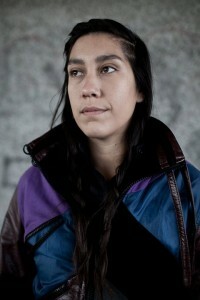 She hails from Kahnawake Nation outside of Montréal and is the instigator of the Idle No More Documentary Performance Project, an oral digital archive about the movement which she sees as intricately catalyzed by working mothers, older women, and youth involved in the struggle for First Nations justice. I reached her via telephone at her home in Toronto on Jan 21 to talk about what she calls the “vibration behind this movement” and how youth, women, and knowledge-sharing are central to its power and expression. The 26-minute interview (Starting at 12min, edited from a 48-minute original) aired today (Jan 30, 2013) on CKUT’s Wednesday Morning After. Special thanks to Courtney and Marc from CKUT for production assistance.